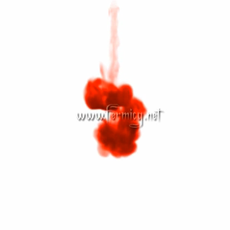 Creating ink drop effect in Maya is relatively simple. We already covered the 2d ink drop effect in my previous tutorial. I recommend you to watch that tutorial first. 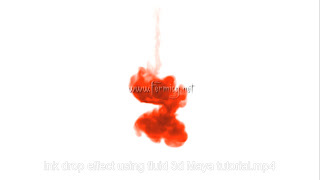 Using 3d fluid container for creating liquids is very hard to control and stimulate. You need a good amount of RAM and hard disc space. Good processor is also very important. Video tutorial can be found at the end of this post. Create a new scene. Set the frame range to 500. Go to dynamics menu and select fluid effects. Click on the property tab of 3d fluid container with emitter. Chose default settings and apply. Play the scene to see the fluid in action. It is more like a smoke than fluid. Select the fluid emitter and place it just below the top boundary. Add some room for the emitter inside the container. Change the emitter density/voxel/sec to 20. Go to frame 20 and add a key. At frame 21 set a key with the value 0. Select the fluid container and go to attributes. Change the resolution to 200. Keep in mind that this is a very high resolution for a computer with 4 GB ram. High detail solve = all grids. Decrease the buoyancy to -1. Colour = your choice of colour. Incandescence to black. We don’t need this. Set the light angles to 0.2, 0.85 and 0.8. We will discuss about the fluid rendering in next part. If you like this tutorial, share with your friends. Give like, favorites and comments. If you have suggestions, doubts and requests comment below. Visit https://www.fermicg.net for tutorials, scene files, textures and video footage.